As of today the Southeast Asian and Asia-Pacific region have found themselves at the center of a complex international process of establishing a new regional architecture. As states carry on fighting for control over strategic sea routes that run across the region, numerous security and transitional threats would appear seemingly out of the blue. Unsurprisingly, the United States is trying to exercise as much influence over the region as it possibly can, even in spite of the fact that over the past decades the influence that Washington exercises in Southeast Asia has significantly diminished. Speaking about the evolution of the US approach to Southeast Asia in the post-bipolar period of global composition, it should be noted that the initial goal of containing the spread of communism that Washington used to pursue has evolved into attempts of ensuring American military and economic dominance in this part of the world. These days the US couldn’t care less about communism, as it’s dead set on opposing the rise of China and Russia and their regional allies. Washington’s new approach to its global strategy became evident after the release of America’s National Defense Strategy and the Nuclear Posture Review, in which China and Russia were designated as primary geopolitical opponents of the US. To achieve these goals, the Trump administration would concentrate its efforts on creating a 400,000 man strong force in the Asia-Pacific region to ensure that at least 50 large military bases across the region remain fully operational at all times. It goes without saying that the absolute majority of those are located in Japan. Among the tools that allow Washington to advance its agenda in the Asia-Pacific region are large carrier strike groups. For the first time since the days of WWII, the Pentagon keeps a total of two carrier groups stationed in the Western Pacific. Additionally, the US Air Force would use strategic bombers on patrol duty over the Pacific, as Washington believes this practice to be a good demonstration of force. The Pentagon is also actively deploying its anti-air capabilities in the Asia-Pacific region, thus provoking an arms race across the region. At present, it has 20 ships capable of bringing down both missiles and aircraft, two THAAD batteries, three PAC-3 missile battalions along with five mobile radars stationed in the region. To ensure its primacy in the region, Washington would place a particular emphasis on expanding its cooperation with Japan and South Korea. This results in those states holding an ever increasing number of joint military exercises, with their total exceeding 30 large military games over the last 18 months. However, as inter-Korean relations begin reaping results of goodwill shown by both Pyongyang and Seoul, along with the progress that Russia and Japan have made in resolving their territorial disputes, Southeast Asian political analysts have begun discussing the issue of Washington maintaining such a leviathanian scale of American military presence in the region and the rationale behind it. As for the prospects of a continuous US military presence on the Korean peninsula, it’s being addressed by China that which recently began insisting on the complete withdrawal of US armed forces from South Korea as a precondition for the complete denuclearization of the DPRK. Chinese authorities are persistent in convincing Pyongyang that this should be the first demand made, since there will be no way to force Washington into leaving once a peace treaty is signed. In turn, Washington is pursuing the goal of maintaining as many troops in South Korea as possible, as those remain an important element of its China containment plan. 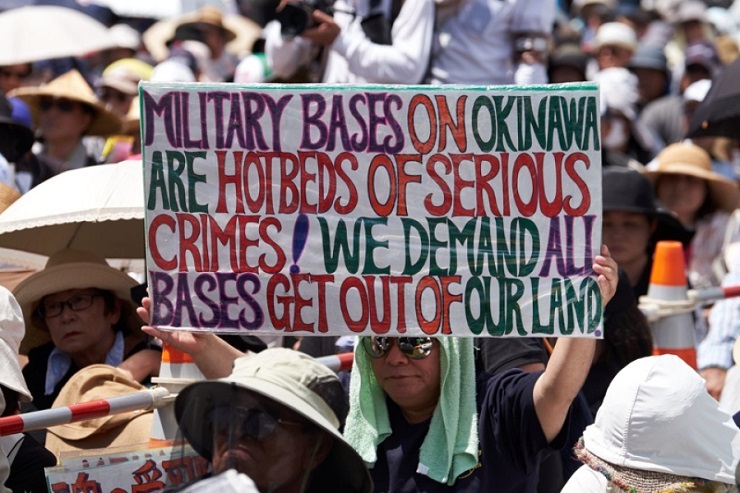 As for the US military presence in Japan, the public pressure applied by various civil activist groups on Japanese authorities is almost palpable. Although Tokyo hasn’t faced a massive public uproar demanding the complete withdrawal of all American servicemen from the country, the number of civil protests demanding this course of action is increasing annually. In addition, the advances that Japan and Russia made in resolving their differences on questions over the Kuril Islands may vanish overnight, should it be announced that American servicemen are here to stay in Japan. As a matter of fact, this presence contradicts the terms of the 1956 agreement between the USSR and Japan, and ever since the day it was signed any further progress has been derailed by the presence of foreign servicemen in Japanese territory. Back in the day, this fact resulted in the USSR abandoning any discussions with Tokyo over the possibility of transferring a part of the Kuril Islands to Japan, as Tokyo signed the Treaty of Mutual Cooperation and Security with Washington back in 1960. After all, in accordance with this treaty, the Pentagon is allowed to build its naval bases all across the territory of Japan. Should it decide to build one on the Kuril Islands once they are handed over to Japan, it will trap the Russian navy in its harbors. It is quite understandable that Moscow will never allow this scenario to occur. To get a better understanding of this deadlock, it is enough to recall the Caribbean crisis of 1962 and the deployment of Soviet ballistic missiles in Cuba. Back then, Washington reacted vigorously to Moscow’s attempt to create a direct military threat to the United States in the immediate vicinity of its borders, which brought the world toward the brink of WWIII. So what reaction should we expect from Moscow should Washington build a naval base on the Kuril Islands? Therefore, without Tokyo demanding the Pentagon to pack up and leave, no further progress in the disputes that exist between Russia and Japan can be achieved. Of course, both Moscow and Beijing in their approach to the question of the lingering US military presence in the immediate vicinity of their shores are driven by their strategic interests. This means that Beijing is going to use any leverage it has to persuade North Korea to abandon its nuclear program in exchange for a US withdrawal, while Russia would never go as far as to consider handing over the Kuril Islands without Japan sending American servicemen home. a certain part of the population of South Korea and Japan is still supporting the strengthening of military cooperation with the United States. the withdrawal of American troops will be accompanied by a substantial increase in defense spendings. In particular, it is said that in South Korea in order to prevent the weakening of its combat potential, Seoul will be bound to spend no less than 30-35 billion dollars. both Japan and South Korea will lose jobs should they decide to close US military bases. It’s stated that South Korea will lose more than 10,000 jobs that were created by the fact that American soldiers needed services that the Pentagon was willing to pay for. It’s estimated that Washington would spend 800 million dollars on those and thus the withdrawal of American troops is going to somehow affect the overall economic growth rates of South Korea. Should those media sources be believed, Japan with its massive industrial potential is going to suffer even greater financial losses due to the withdrawal of US forces from Japan. Under these circumstances, the ruling political circles of South Korea and Japan have to decide whether the costs and the lost income associated with persistent tensions those two states have with their neighbors are worth the pay Washington is providing them with. It goes without saying that neither nation can hope to secure full political independence without sending American troops home. Moreover, the signing of peace treaties with their neighbors will eliminate the need to carry on the arms race that Washington initiated, as both Japan and South Korea are bound to buy expensive outdated weapons produced by the United States to the detriment of their national interests. For sure, the final word on this matter should not be left to the political elites of South Korea and Japan who are closely tied to Washington, but to the population of these countries, since they are being described as democracies by the Western media.